SoftPlanet makes it possible for everyone to get free Yandex Browser download directly from our servers. There is no registration needed for downloading. Yandex Browser 14.5.1847.18774 is a webkit-engine-based web browser. Other popular applications like Google Chrome and Safari use the same engine for rendering web pages. This guarantees great performance. Actually, the Chromium project is the main source of Yandex Browser. It is completely free of charge as well. 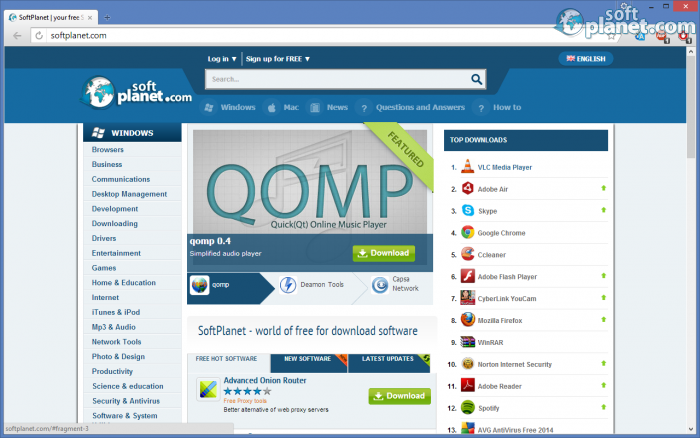 Since this application uses the same engine as Google Chrome it has some of its features as well. For instance, a SmartBox feature, which enables users to search for a word or phrase within the address bar. Thus you don't need to open a separate tab. It is also able to check downloading files for viruses with Kaspersky security solutions. 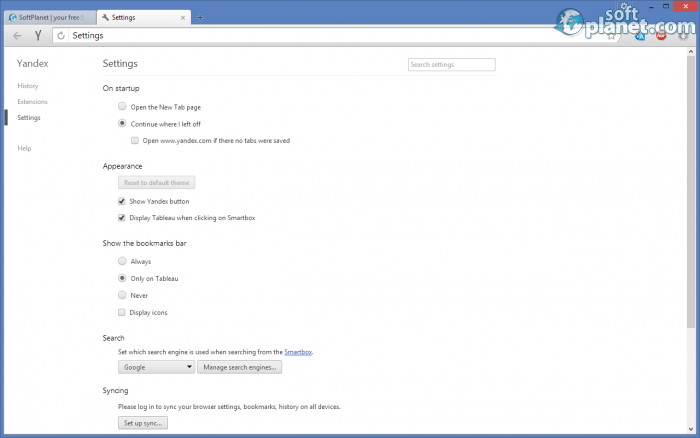 In addition, you are able to sync Yandex Browser 14.5.1847.18774 with other browsing utilities and set it as a default one if you prefer. When it comes to its interface there are a few similarities as well. Just like any other modern web browsing software solution it comes with a tabbed GUI, which makes it very user-friendly. The New Tab page is really well-designed as well. It reminds of Metro UI of Windows 8. Basically, this application combines some advantages of other similar apps, which is really great and makes it a proper choice for any user. After a whole day of using it, we really started to love this software, because it looks a bit different than other solutions on the market, but still provides you with excellent user experience. For instance, you can still rearrange current tabs and use extensions. It didn't crash once during the entire team test. It demonstrated great overall performance actually such as speed, stability and reliability. Yandex Browser is a proper substitution of the popular web browsing apps like Google Chrome, Mozilla Firefox, etc. So if you are looking for something different but yet efficient, this one is the right choice for you. Our security scan shows that Yandex Browser is clean from viruses. The current version of Yandex Browser has been scanned by our system, which contains 46 different anti-virus algorithms. That ensures that Yandex Browser 14.5.1847.18774 is 100% safe for your computer.